Software for computer simulations of learning systems. Machine Learning software is aimed at finding such a system configuration that allows to cooperate with environment most efficiently. To learn more about machine learning go to machine learning page. 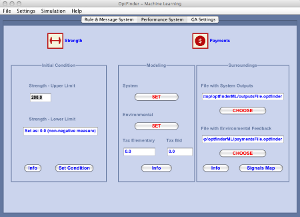 The OptFinderML software is written in Java and can be run on various operating systems. This numerical package is designed for Java(TM) SE Runtime Environment version 8. At the very beginning, an user should design a set of rules. Each rule contains a pair of condition and corresponding system answer when this condition is satisfied. Our system cooperates with an outer structure called environment or surroundings. This collaboration is done by a flow of information between the both structures. Firstly, environment send a set of messages to our system. They can be loaded from a file or downloaded from a remote server by an internet connection. Then on the basis of assumed rules system generates its answers. If an obtained message matches a condition pattern the message is allowed to attend an auction. The user must decide which auction schemes is going to use. Available options are listed in the table below. When the auction is done then the generated answer is sent back to environment. This can be done either by writing data to a file or by uploading data via internet. It depends on user's requirements. Consequently, these system answers are detected and interpreted the an outer structure. When answers satisfy our outer 'teacher' then system is granted otherwise is punished. This exchange of information teaches our system how to react correctly to messages generated by environment. During OptfinderMl simulations conditions are treated as genotypes in genetic algorithms. To each condition (genotype) is assigned a numeric value being its strength. The genotype's strength (=classifier's strength) is equivalent to the fitness function in genetic algorithms. 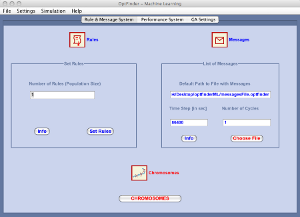 Thus, all parameters used in genetic algorithms find their applications also in the OptfinderML simulation. All of them are presented in the table below.